Description: New Suick Red Hot Thrillers! Setting the Musky Fishing world literally on its side is the new Red Hot Thriller, by Suick. Same, wounded baitfish action, as the original Muskie Thriller. The only difference here is that the lure, or the wounded baitfish, appears to be swimming on it's side. With Blood Red hooks and a menacing realistic 3-D eye, the Suick Muskie Thriller offers one of the most lifelike presentations on the water. Buy it. Fish it. And hang on! Muskies and Northern Pike love Suicks. 9", 2 1/4 oz. Description: One of the most productive Musky lures ever designed. The 10" Suick Muskie Thriller color patterns are spectacular, lifelike and highly appealing to the eye. Workmanship, component parts, and product performance is truly top shelf. With practice you will be amazed that you can fish through thick weeds with this dive and rise jerkbait by Suick. Muskies and Pike love them. 10", 2 1/4 oz. Description: The 10" weighted Suick Muskie Thriller is truly a classic. 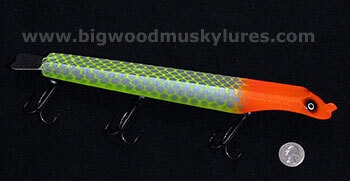 Suick Muskie Thriller color patterns are spectacular, lifelike and appealing to the eye. Workmanship, component parts, and product performance is truly top shelf. With practice you will be amazed that you can fish through thick weeds with this dive and rise jerkbait by Suick. Muskies and Pike love them. 10", 2 5/8 oz. Description: The Suick Muskie Thriller is bigger and better than ever! When you need a big wood musky lure, grab a Suick Muskie Thriller and hang on. Emulates a wounded or sick baitfish. A true classic in a bigger size. Muskie and Pike love them! 12", 3.5 oz.